Building collapse at Ita-Faji area in Lagos. Lagos — Many school children are feared dead and scores injured as a three storey-building collapsed at Itafaji area of Lagos on Wednesday. 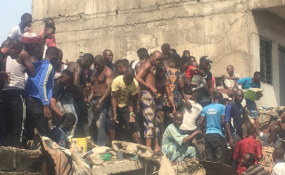 It was gathered that rescuers from the Lagos State Emergency Management Agency (LASEMA) , police and locals are battling to rescue several others still trapped under the ruble of the collapsed building. It was learnt that the structure collapsed around 10:00am while class was on. As at the time of filing this report, many pupils are being rushed to the General hospital, Marina, while parents are trooping there to search for their children. It’s gathered that over 100 pupils are feared trapped.